The difference in life between a successful person and a failure is how someone deals with adversity and obstacles. 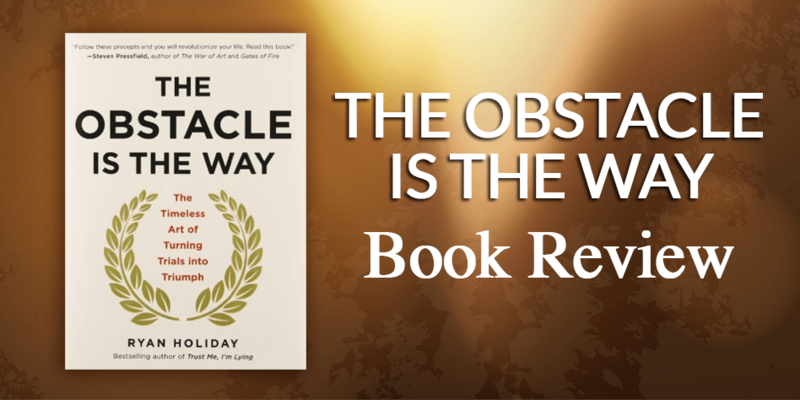 In “The Obstacle Is The Way“, Ryan Holiday calls this out and uses a number of historical references to illustrate examples where some of the greatest people to have ever lived not only overcame obstacles but used them almost to their advantage. It’s a powerful way of looking at a problem. As I get older, I become more acutely aware of just how important your mindset is when facing almost any situation in life. I’ve been blessed with a pig-headed ignorance to just push through problems until I get to the solution, but for many people, even the slightest impediment becomes insurmountable. This is where the examples that Holiday uses throughout “The Obstacle Is The Way” really shine. He shows you numerous examples and ways of getting past obstacles. Thomas Edison simply saw the burning down of his warehouse as a way of decluttering and starting again or how Demosthenes was born with a crippling speech impediment and worked hard to overcome incredible odds to become Ancient Greece’s most respected orator. Each example that Holiday uses shows you a different way of overcoming obstacles that utilises a different personality trait. To be honest, I found it quite inspiring. I’m not easily inspired either – I generally find books that aim to inspire you are trite and saccharine in their approach, but this book isn’t, it’s well researched and well presented. The central narrative and most heavily used reference is Marcus Aurelius and in particular his quote, “The impediment to action advances action. What stands in the way becomes the way” which is the primary theme of the book. There are however a few problems with the book. First of all, I found it a bit slow to get into. That’s quite problematic when you’re not entirely convinced about the topic or the author anyway. I really had to push through to get into the meaty parts of the book and was honestly pretty close to giving up just a few pages in. Secondly, the book talks a fair bit about Greek Stoicism. As a reader, if this isn’t a philosophical construct that you’re familiar with then it can be really hit or miss. I’ve read Meditations by Marcus Aurelius, Discourses by Epictetus and am familiar with the works of Cicero and Seneca, so I understand stoicism – if you don’t, then this book could be hard going for you. My final criticism of the book is that it feels like a research essay without much analysis wrapped around it. Ryan Holiday has clearly done the work to pull together some great stories from really interesting people across the span of human history, but it just felt like he didn’t do enough to make me appreciate his effort and contribution beyond simply being the curator of the stories. That’s might be a little unfair, but that was the impression I came away with. With all of that said, I would really recommend this book to people – in fact, I already did! I was in a lift yesterday and talking to someone I work with. He was telling me about a project he’s struggling with where the client keeps putting obstacles in the way of the team completing their work. I suggested he take the weekend out and read this book. What “The Obstacle Is The Way” does do really well, is to show you ways of thinking about problems as opportunities. It has a series of well-explained examples that you can apply to help you overcome the obstacles in your path and in that sense, it makes the book really approachable once you get past some of the initial hurdles – which is ironic considering the topic. If you’re looking for someone to rev you up and get you inspired with “rah rah” chanting, then this isn’t for you. If you’re looking for something a bit more cerebral and can appreciate the well-told stories from history, then you’ll really enjoy this book.